Polydectes was a king of Seriphos in Greek mythology, famous for being the king who would command the hero Perseus to obtain the head of Medusa. The common story has Polydectes being the son of Magnes, the first king of Magnesia, and an unnamed Naiad, who was possibly the Naiad nymph of the main spring of Seriphos. This Naiad nymph would also give birth to a brother for Polydectes, Dictys. Magnes would stay in Magnesia, whilst his mistress would make her home upon Seriphos. Alternatively, Polydectes was not a son of Magnes, but was instead a son of Poseidon and Cerebia, or of Peristhenes and Androthoe. In any case, when of age, Polydectes would become king of the island of the Western Cyclades, known as Seriphos. Polydectes comes to prominence when his story overlaps with that of Danae and Perseus. Danae and Perseus had been set adrift at sea by Danae’s father Acrisius, so that he might avoid a prophecy about his own death. The chest in which Danae and Perseus were placed would wash up upon the shoreline of Seriphos, where it was found by Dictys, the brother of Polydectes who was fishing. Dictys would care for Danae and help raise Perseus, but the beauty of Danae soon caught the attention of Polydectes who wished to marry the daughter of Acrisius. Perseus though was extremely protective of his mother, and prevented Polydectes from getting close to Danae; it is commonly presumed that the protectiveness of Perseus came about because Polydectes was a violent tyrant. Annoyed by Perseus, Polydectes comes up with a plan to get rid of Perseus and free the way for the king of Seriphos to marry Danae. Polydectes told Perseus that he planned to marry a woman called Hippodamia but required a suitable wedding gift to ensure the successful marriage; and of course only the head of the Gorgon Medusa would be a suitable gift. Perseus was so pleased that his mother would soon be left in peace that he agreed to obtain the head of Medusa for Polydectes. Perseus was unfazed by the dangers of the quest, whilst of course, Polydectes presumed that Perseus would be killed in the attempt. Perseus was absent from Seriphos for an extended period of time, but eventually, having been aided by Athena and Hermes, Perseus would return to the Greek island. 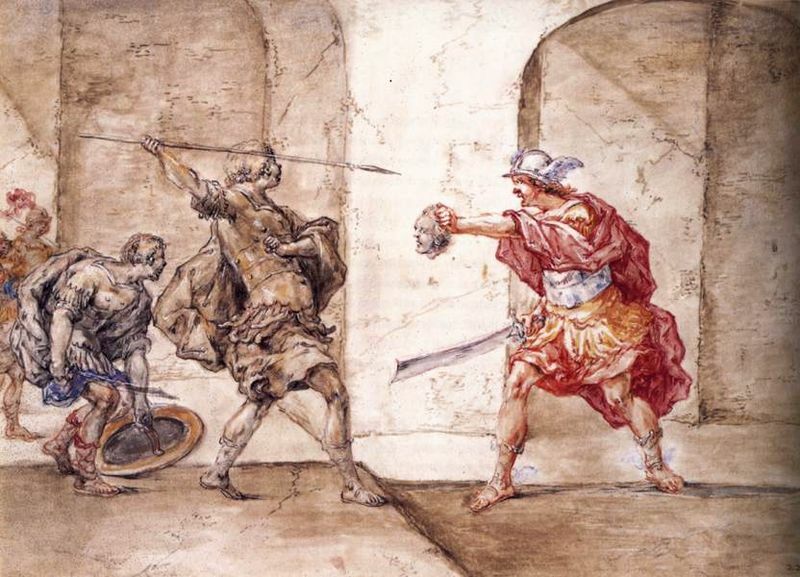 Some tell of how Perseus returned to Seriphos at the very moment when Polydectes was forcing Danae to marry him; or else Danae was in hiding from the abusive Polydectes, and was being protected by Dictys. In either case Perseus saw how Polydectes had tricked him, but Perseus simply removed the head of Medusa from its satchel and turned Polydectes and all his followers to stone. With the death of Polydectes, Perseus would make Dictys king of Seriphos, before Perseus and Danae returned to Argos, the land of Acrisius. The story of the tyrannical Polydectes is the most common one today, but there is an alternate story that say Polydectes was actually a good king, one who married Danae when she was washed up on Seriphos, with Perseus being raised in the temple of Athena. Acrisius though would come to Seriphos for he had heard that his grandson was still alive, and planned to kill him before Perseus killed him; for this was what an oracle had forewarned. Polydectes though, would intercede on the behalf of Perseus, and prevented bloodshed between grandfather and grandson. Polydectes would unexpectedly die at this point and funeral games were held for the king of Seriphos, it was then said that Perseus would accidentally kill Acrisius during these games with a thrown discus. This version of the Polydectes myth doesn’t explain the need for the head of Medusa, nor the fact that Acrisius is more commonly said to have died in Larissa, Thessaly.